Apart from the ASEAN Free Trade Area (AFTA) between ASEAN member states, the regional trade bloc has signed several FTAs with some of the major economies in the Asia-Pacific region. These include the ASEAN-Australia-New Zealand FTA (AANZFTA), the ASEAN-China FTA (ACFTA), the ASEAN-India FTA (AIFTA), the ASEAN-Korea FTA (AKFTA), and the ASEAN-Japan Comprehensive Economic Partnership (AJCEP). The aim of these FTAs is to encourage and promote businesses of all sizes in ASEAN to trade regionally as well as internationally without tariff barriers. 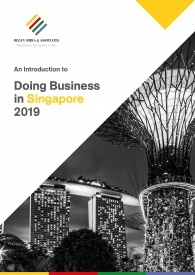 Businesses with operations in ASEAN can use the FTAs to gain easy access to new export markets for their products at low costs, and benefit from simplified export and import procedures. The agreement establishing the ASEAN-Australia- New Zealand Free Trade Area (AANZFTA) entered into force in January 2010. The FTA is the most comprehensive agreement covering a wide range of issues including trade in goods and services, investment, intellectual property, competition as well as economic cooperation. Since its inception, the AANZFTA has encouraged trade in goods and services by removing barriers and reducing transaction costs for companies wanting to do business in member countries. According to the agreement, 99 percent of the Australia-New Zealand trade in goods with Indonesia, Malaysia, the Philippines, and Vietnam will be duty-free by 2020. Upon full implementation in 2025, almost all trade between the member countries will be free of tariff, helping businesses save millions of dollars in tariff duties each year. Over the past decade, trade and investment between ASEAN member states and China have expanded significantly under the ambit of the ASEAN China Free Trade Area (ACFTA). The Agreement on Trade in Goods was signed in 2004 and implemented in July 2005 by all the member countries. Under the agreement, the six original ASEAN members and China decided to eliminate tariffs on 90 percent of their products by 2010, while Cambodia, Lao PDR, Myanmar, and Vietnam – commonly known as CLMV countries, had until 2015 to do so. 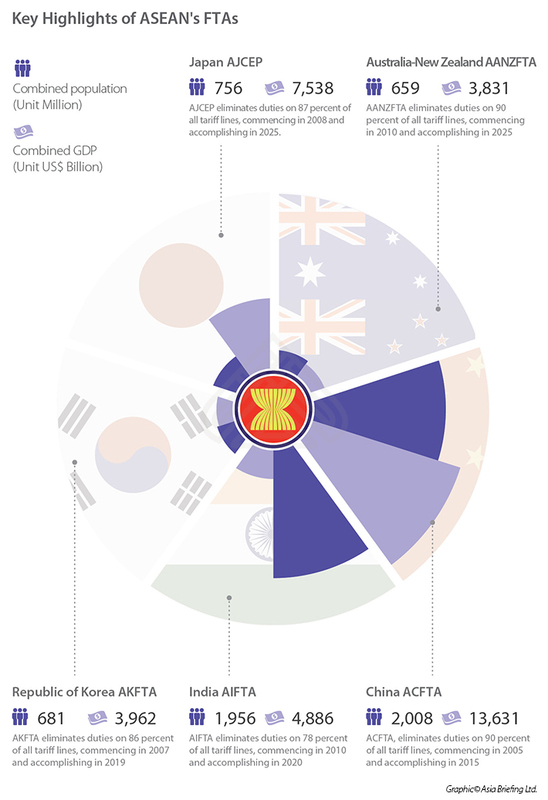 Since the signing of the agreement, China has consistently maintained its position as ASEAN’s largest trading partner. In 2015, ASEAN’s total merchandise trade with China reached US$346.5 billion, accounting for 15.2 percent of ASEAN’s total trade. 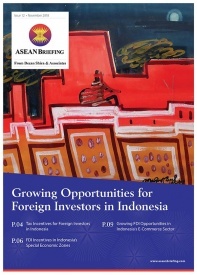 Additionally, ASEAN received US$8.2 billion in foreign direct investment (FDI) from China in 2015, placing China as ASEAN’s fourth largest source of FDI. By 2020, ASEAN and China are committed to achieving a joint target of US$1 trillion in trade and US$150 billion in investment through ACFTA. 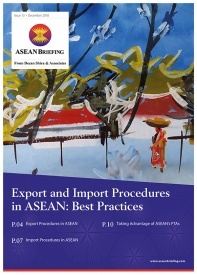 The ASEAN-India Trade in Goods Agreement entered into force on January 1, 2010. The signing of the agreement paved the way for the creation of one of the world’s largest free trade area market, creating opportunities for over 1.9 billion people in ASEAN and India with a combined GDP of US$4.8 trillion. AIFTA creates a more liberal, facilitative market access, and investment regime among the member countries. The agreement set tariff liberalization of over 90 percent of products traded between the two dynamic regions. Accordingly, the tariffs on over 4,000 product lines were agreed to be eliminated by 2016, at the earliest. 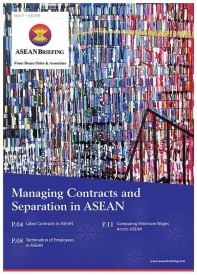 The ASEAN-Korea Trade in Goods Agreement was signed in 2006 and entered into force in 2007. It sets out the preferential trade arrangement in goods among the ASEAN Member States and South Korea, allowing 90 percent of the products being traded between ASEAN and Korea to enjoy duty-free treatment. The Agreement provides for progressive reduction and elimination of tariffs by each country on almost all products. Under the Trade in Goods Agreement, ASEAN-6 including Brunei Darussalam and Korea have eliminated more than 90 percent of tariffs by January 2010. 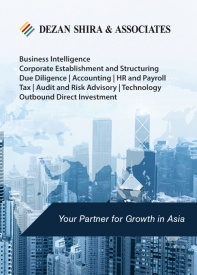 The ASEAN–Japan Comprehensive Economic Partnership (AJCEP) came into force in December 2008. The Agreement covers trade in goods, trade in services, investment, and economic cooperation. The FTA provides for the elimination of duties on 87 percent of all tariff lines and includes a dispute settlement mechanism. It also allows for back-to-back shipment of goods between member countries, third party invoicing of goods, and ASEAN cumulation. Both ASEAN and Japan have also initiated several economic cooperation projects that include capacity building and technical assistance in areas of mutual interest. 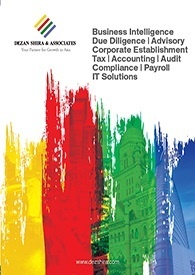 These areas include intellectual property rights, trade related procedures, information and communications technology, human resources development, small and medium enterprises, tourism and hospitality, transportation and logistics, among others.